Been almost a week(! ), but above is some video I shot at the Foo Fighters' recent show at Citi Field on July 15. 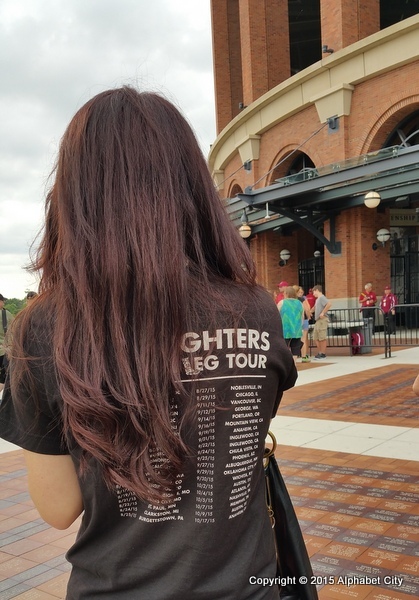 I've been a Foo Fighters fan since the beginning - I still remember the video debut for "Big Me", and I actually came home from work early so I could watch premiere of "I'll Stick Around" back in 1995. (I was a Nirvana fan before.) That first album's still great, but it was "The Colour and the Shape" that sounded as if it was speaking directly to me and what I was going through myself at the time. Since then I've felt like Dave's a brother of mine. If I have a current rock idol, someone I try to emulate myself, it's Dave Grohl. But this was my first-ever Foo Fighters show. I was a little embarrassed when Dave called out the first-timers in the crowd by sarcastically saying "we've only had a band for like 20 years, but you know, it's cool." I can't believe it's been that long. The Foos had a pop-up store in the Lower East Side of Manhattan that happened to be only a couple blocks from the store my wife and I own. So we went for the whole experience, buying all of our merchandise there first. My wife outside Citi Field in her "Broken Leg Tour" t-shirt. The front of that shirt - I bought one too. Not that Dave could really hide the fact that he's got a pretty horridly broken leg, but he's embraced it fully on this tour, maybe even to the point of excess. To be honest, the first time I saw his now-famous stage throne, I threw up a little in my mouth. It seemed so pretentious. I would have preferred something a little more understated... like maybe this IKEA chair. He did joke about it (he called it "ridiculous" even though he designed it himself), and gave a full PowerPoint presentation on his leg break and the throne's creation. That's Dave in the hospital on the monitors, during his slide show. And on his throne in real life. I'm usually not a fan of acoustic stuff at rock shows but one of the highlights on this tour has to be "My Hero", the chorus of which Dave sits back and lets the crowd sing to him. And it's pretty clear that we are all singing it to him. (Just listen to it in the video above.) Say what you want, the man deserves it. 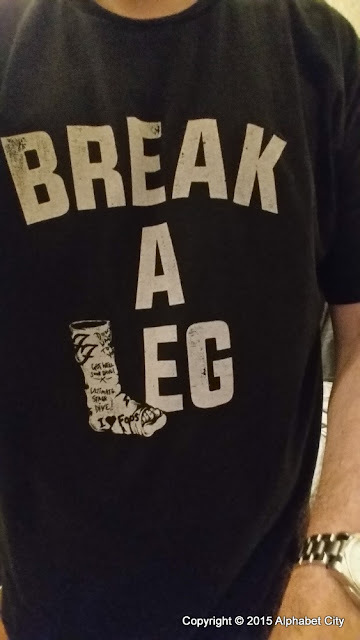 His leg's shattered in a million friggin' pieces, and he's coming out there every night and giving us close to three hours of music with as much effort as two-legged guys half his age. At times it did seem a little more than even he can carry, though. I knew from videos I'd seen that his raspy voice is never really as precise live as it is on the albums, but he had practically lost it completely by about midway through the show at Citi. And after about the 15th song, you could sense a little energy drain, at least until the big finale with Chad Smith of the Chili Peppers. I finally had to sit down myself during "Outside", and I was up and down from then on. 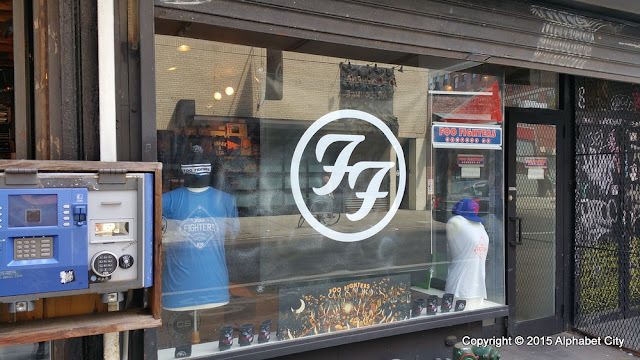 But "White Limo", "Arlandria" and "Best of You" are three of my favorite Foo songs, so they ended big. 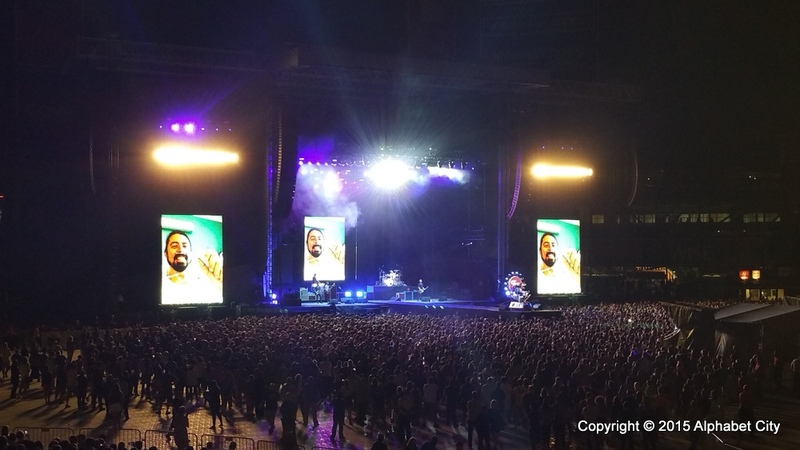 This was probably my third or fourth outdoor stadium show, and it's no big secret that the only worse way to experience a rock concert is by staying home. The sound at Citi Field was pretty terrible, and at times Dave's voice was barely even audible. Even though we were on the field level, this was the furthest I've been from a band at a show since I saw (coincidentally) Rush in 1986 at Brendan Byrne Arena in New Jersey, when we were literally in the top row of the furthest possible corner from the stage. (At least for Pink Floyd and Monsters of Rock at Giants Stadium, we were on the floor.) I can't imagine the view, or lack thereof, of those few hardy souls in the upper deck at Citi Field. But it was fun, I had some great food and a great time with great company (my wife! ), and I finally got to see one of my all-time favorite bands on what's no doubt going to go down as a historic tour for them. Nooooooooooooothing to complain about here. Thanks, Dave, for making the effort for your fans.